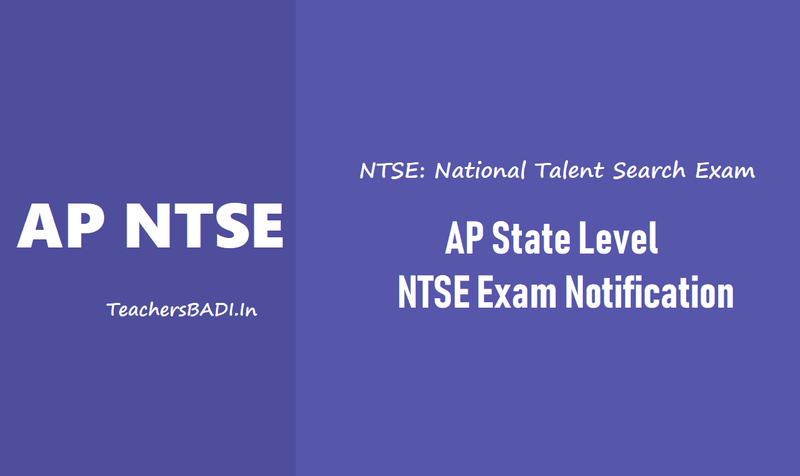 AP NTSE 2018 Notification for Class X: The state level National Talent Search (first level) Examination 2018 Notifications to be issued by the office of the Director of Government Examinations,Andhra Pradesh. The State Level National Talent Search 1st level Examination for 10th class students will be conducted on 04-11-2018 (Sunday) from 10.00 AM to 01.00 PM in Telugu/ Hindi/ Urdu and English media at all the Head quarters of 13 Districts in the State. AP - State Level National Talent Search (1st level) Examination (NTSE) for Class X: Office of the Director of Government Examinations, Andhra Pradesh invites applications for the State Level National Talent Search (1st level) Examination (NTSE) for Class X.
Eligibilities: The students who are studying X class during the current academic year i.e., 2018-19 in any recognized school in AP including KV, Navodaya Samities and Schools affiliated to CBSE and ICSE New Delhi. The students who are studying X Class during the current academic year i.e., 2018-2019 in any recognized school in Andhra Pradesh, including Kendriya Vidyalayas and schools affiliated to I.C.S.E. and C.B.S.E., New Delhi are only eligible to appear for the above said Examination. The students who have selected for NMMS scholarships and studying X class now may also eligible for NTS Examination but such candidates have to forego the further NMMS scholarships, if he/she are selected in NTS Examination. N.C.E.R.T, New Delhi has changed the examination pattern from this year onwards. Language Comprehensive Test (Telugu/Urdu/English) for 50 marks (Only for qualifying), Mental Ability test for 50 and Scholastic test is for 100 marks. The distribution of marks and questions are as follows. The time limit was not changed. There will be two-stage selection process for award of scholarship to class X students of AP. For Stage I, selection will be done by the both states of AP through NTS first level examination November-2018. The Students of AP, who qualify Stage-I, will be eligible to appear for Stage-II examination, conducted by NCERT. The Examination fee is Rs.200/- (Rupees Two Hundred only) per candidate. The Examination fee is Rs. 200/- (Rupees Two Hundred only) per candidate. The examination fee has to be paid in SBI Treasury branch, which was generated after submission of online application form. Information can be obtained from the concerned District Educational Officer or from the under signed. Applications should be uploaded in the website www.bseap.org and printed application forms should be submitted in DEO's office of the District concerned only. For any further details in this regard the concerned District Educational Officer or Office of the Director of Government Examinations, A.P., Hyderabad may be contacted. Rc.2, Dt.19/8/2018: National Talent Search Examination(NTSE) -2019 (First Level)-Applications are invited through Online-Certain instructions. NTSE 2019 -1st level examination will be conducted on /11/2018 from 10.00AM to 1.00 PM in all District Head quarters in the state. Fee particulars: The examination fee Rs.200/- (Rupees two hundred only) per candidate. the examination fee has to be paid in SBI Treasury branch ,which was generated after submission of online application. What is the scholarship amount ?